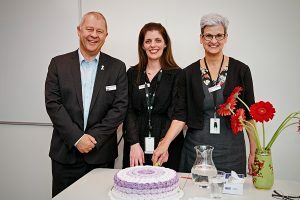 The official opening of the Hume NDIS office held on 19 March was a reflection of the partnership between the Brotherhood and NDIA at the co-located Broadmeadows office, a national first. Guests from local council and disability organisations were in attendance to mark this significant occasion for the Hume community. A Welcome to Country was delivered by Kellie Hunter, a Wurundjeri woman who has grown up and lived in the Hume area for over 30 years. The ceremony was a powerful way to commence the occasion. Executive Director of the Brotherhood of St Laurence, Conny Lenneberg said the Brotherhood’s work in Local Area Coordination demonstrated our mission to “show compassion and generosity of spirit” to those who experience disadvantage in the community. NDIA General Manager of Pathway Design, Scott McNaughton spoke of the fantastic progress to date, with mention of the work ahead to ensure people with a disability across the Hume Moreland area were supported in their transition to the Scheme. The afternoon highlighted a shared commitment in ensuring that every person we work with has a positive experience leading to improved outcomes, with participants being at the forefront of our work. 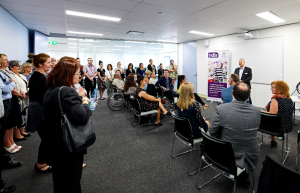 The opening of the Hume NDIS office in Broadmeadows is an important milestone for people with a disability, their families, carers and the broader local community.